I once was visited by a baby chipmunk. I was out for a hike with my husband and we were at the back of the car putting our boots on. This tiny chipmunk came up to us and just explored all over the place, running up our boots and between our feet. 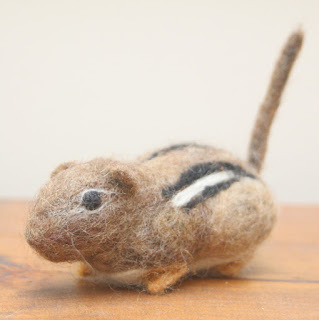 This Chippy is entirely needle felted and is wool through and through. The colors are natural wool tones as well as hand dyed by me, with food-grade dyes. 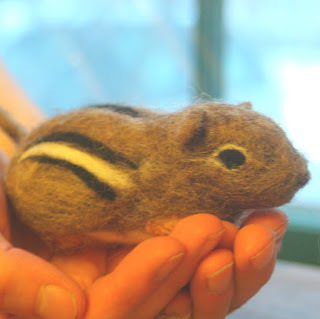 Here's a picture of the real chippy from that hiking trip.